Banking on Your Final Resting Place Funeral Planning: Will You Prepay This Rising Expense? We talk a lot about how much money you need to live a healthy and wealthy retirement, but dying isn’t cheap either. Besides sadness and grief, death also comes with a hefty price tag. Funeral costs have risen faster than nearly everything else has over the last 30 years. The average funeral cost has skyrocketed 227% while prices for all items have risen 123%. Of course, how much you pay depends on how you check out. The median cost of a funeral with a viewing and in-ground burial was $7,360 in 2016. That bill jumped to $8,508 if you included the price of a vault, which is required by many cemeteries. Cremation is cheaper. In 2017, the average cost of a funeral with a viewing and cremation was $6,260. The price of kicking the bucket is now higher than that of a reliable used car. It’s no wonder more people than ever are choosing the cheaper option. For many, it’s also the most convenient. 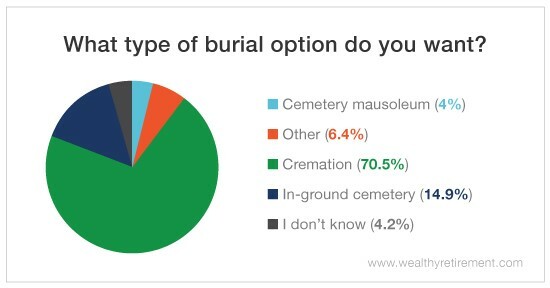 Our recent survey found that 70.5% of our readers plan to be cremated when they die. That’s right in line with projections. 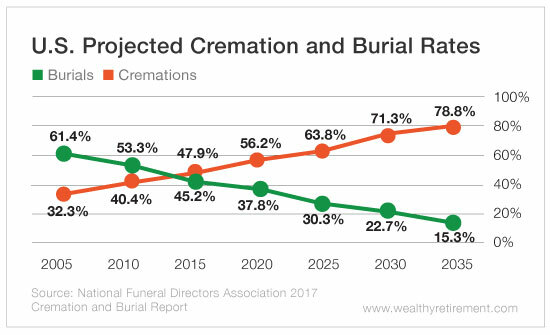 The National Funeral Directors Association forecasts that cremations will account for 71.3% of funerals by 2030. But while 96% of our readers have chosen their burial option, just 67% of them have preplanned their funerals or, at the very least, made their final wishes known to their families. If you haven’t talked to your children or other relatives about what you want after your death, you should. You don’t want your family to have to guess your wishes. If your loved ones don’t know that you’d rather be cremated, they may feel bad about choosing that option. You’re liable to end up in a box six feet under! 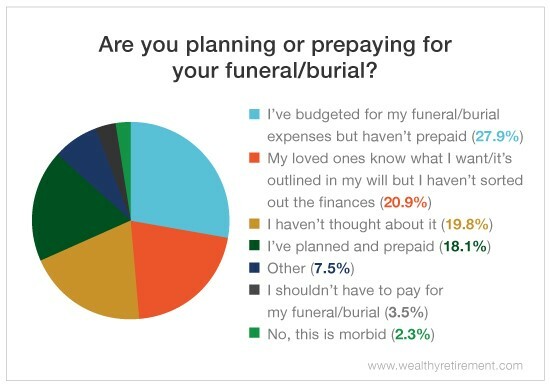 Of course, the only way to guarantee that you get the funeral you want is to plan and prepay for it yourself. As an added bonus, Medicaid considers prepaid funerals to be excludable assets. Irrevocable funeral trusts qualify for the Medicaid spend-down process. However, Medicaid-allowable funeral expenses vary by state, so be sure to check your specific state’s laws. Prepaying doesn’t come without risks. Funeral directors can go bankrupt or even embezzle your money, so it might not be there when you need it. And if you move or decide you want to be buried somewhere else, you could be out of luck. That’s why planning your own funeral and setting aside the funds to pay for it could be your best option. Thinking about death is scary. Talking about it isn’t fun either, but we’re all eventually going to die. Most of us know what our wishes are, so communication is key when it comes to our funeral plans.